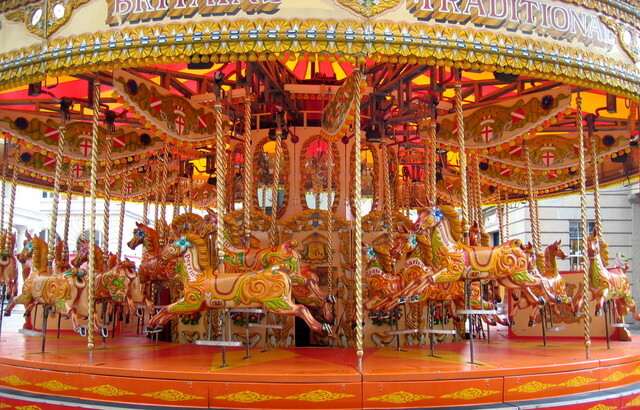 Are Christians in your town on the Churchy-Go-Round? Church #1 is Neighborly Church, a large (well, it was once) non-denominational church that prided itself on multi-media holiday spectaculars by its drama dept, its fantastically fun youth programs and its solid bible teaching. There were Wednesday night potlucks and events to invite neighbors to in hopes of rubbing the gospel off on them. Then eventually the good-hearted, well-loved, founding pastor grew older, portlier and tired-er (is that a word?) 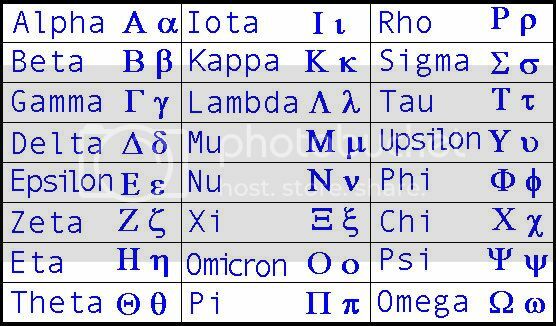 and then re-tired (I do know for a fact that this is correct English). Along came Replacement Pastor #1 – he didn’t stick, but the second time around, the Board was going to get it right: they were successful in finding a man who was called, capable, and charismatic (oops!!!). Well, he shook things up, and was a significant catalyst in initiating the churchy-go-round. Finally after a decade & a half of challenges and crises, Neighborly Church had a mostly amicable separation from Mr. Shake-up-the-Saints and chose a smoother, but sound son who had grown up at Neighborly and had come back to serve his home congregation. The second church on our tour we will call Gethsemane Gardens, also a large “non-denominational” but distantly charismatic church that is decidedly autocratic in its operations: you will do church government this way (it’s the pastor’s way or the highway), you will teach the bible that way (Gethsemane Garden’s founding pastor’s beliefs or the highway), and you will like it (Ja wohl, Herr Pastor!). Very solid in biblical teaching (just ask them), it was stable, dependable, you knew what to expect, and the church had made special arrangements with the Almighty to zap you away before anything really nasty happened on earth – it made them feel downright rapturous. So Church #2 heard about some of the ‘Charismania’ happening at Church #1 and began a series (not sure how that worked since it didn’t conform to their verse-by-verse methodology) on how it was disorderly and out-of-control. They even distributed tapes (yes, it was the early ‘90’s, before wide use of CD’s and long before podcasts) decrying the debauchery of this fellow Trinitarian, grace-believing body. This disturbed some of the meeker ones at Neighborly and caused many to leave. Along comes Church #3, a mainline denominational church that got religion and started preaching the actual gospel; we’ll call them Sidwell Cholosterolarian Church. Sidwell is close to the college and began some earnest outreach to the kids. They relaxed their music in one or two of their services, dumped the hymns, brought in the drums and electric guitars and repetitive, syrupy choruses (hey, whatever works). Sidwell even started a gospel choir, causing defections from Neighborly’s gospel choir. They got a great children’s program going (some moms even started referring to Sidwell as “kid well”). The church hired a benevolent, loving senior pastor. In short, it became a kind of rehash of the early Neighborly Church and many Neighborly people flocked to Sidwell, even though they couldn’t be fully immersed any more nor believe that God actually loved the entire world. But at least it was like old home week every Sunday. To round out the churchy-go-round, there’s Church #4, Freely Scand-tastic, kind of a Baptist light, and Church #5, Grace Place. While Freely Scand-tastic and Grace Place play a lesser role in our scenario, they still swap Christians back and forth with the others regularly. Besides these five there are numerous smaller churches involved in the same slave trade – did I actually say that? So the name of the game in our medium-sized town is to find the church with the most-est: The best programs (already formulated and set in motion, not too demanding of newcomers), facilities, music, specialty pastors, well-heeled members that invite you to their bible studies and maybe even their summer swim parties, smoothest running, well-attended, best spoken of, thought-provoking but not too challenging, with the nicest kids… The question being asked is (although its never admitted) “How do I get the most for the least amount of effort?” Let’s not forget another rationale for moving we really don’t like to talk about: Offense! I need to avoid so-and-so; its easier to change churches than address the problem, forgive them, or (gulp!) ask forgiveness for a wrong committed. The churchy-go-rounders are never satisfied for long; if Church #1 doesn’t cut it, they move on to Church #2; they grow tired of that and move to Church #3. In time, they may even show their faces again at Church #1, schmoozing the people that never left by telling them that it was the rightest place all along. OK, seriously, I’m not saying we don’t need to change churches once in a while. There are certainly legitimate reasons to do so, but if you ask me, they are few and far between. What better communicates your love for God and His people than sticking with them through thick and thin; by rolling up our sleeves and getting our hands dirty; by being part of the solution rather than part of the problem? Is church about being coddled or about serving our fellow sinners saved by grace? Have you been on the churchy-go-round? Has it really been character building for you and a testimony to your family, neighbors and co-workers? Or has it just further cemented their opinions that Christians are shallow and me-oriented, just like the rest of society? Get committed. Grow where you’re planted. Get off the churchy-go-round. Has anyone read this book? I couldn’t put it down-I read it cover to cover in two days. It was really an eye-opener, explaining macro-economics in fairly simple terms. The authors believe we’ve been in a very long ‘bubble’ economy (inflated beyond what economic fundamentals dictate), starting around 1982. Their first book, America’s Bubble Economy, published in 2006, predicted a series of six bubbles that would soon burst, collapsing the artificially high level of growth we’ve had since the ’90s. The first four bubbles began popping in 2007 starting with real estate, followed by the stock market crash in 2008. The other two, personal debt and discretionary spending, are derivatives of these. The remaining bubbles (government debt and the U.S. Dollar) haven’t popped yet, but when they do we’re going to have high inflation and high unemployment for years. They show how the Fed has inflated the money supply by 3X what it was just 2 years ago (never been done before), and there is no sign of that stopping since its the only thing keeping us from sinking into a depression. The problem is, the longer it goes on, the longer the eventual depression will last and the deeper it will be when the government debt bubble finally pops. Their thesis: when the supply of money increases, as with anything its value goes down, meaning it buys less. This is the sole reason for inflation, and is a separate phenomenon from, for example, ‘supply and demand.’ America’s current national debt is over $15 trillion (see debt clock to the right of this article), and the book says the Fed will continue to increase the money supply (by buying bonds) until the debt reaches about $20-$25 trillion, at which point no one, individuals nor foreign central banks, not even the Fed, will buy our obligations anymore. And as the money supply increases, the value of U.S. Dollars will deflate big time. Bottom line–they highly advise getting low, fixed-rate loans on your home, making only the minimum payments (because of inflation it will be easier to pay off those dollars in the future) dump all other RE, sell your business, sell stock, sell any valuables/collectables, pay off your car (its easy to repossess if you lose your job and can’t make payments, while your home will be difficult to take away), and buy GOLD. They say that for many years it will be the only thing that will hold its value, particularly because of its demand in the Middle East and Asia. At a certain point, far into the mega-depression, actually near its end, gold will be a bubble also and then it will be time to sell. But not now. Buy now. 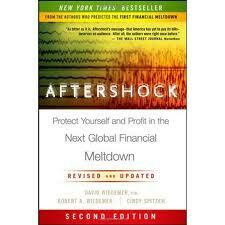 Wiedemer and partners foresee this ‘Aftershock’ starting in about 2013-2016. 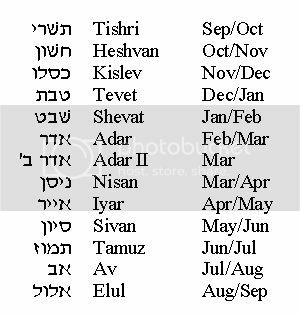 They don’t give exact dates, because its timing depends on a lot of factors, including the actions of the Fed, Congress, and what happens internationally. But they do believe at this point it is unavoidable, due to the unpayable U.S. debt and huge increase in our money supply. Aftershock was not written from a spiritual perspective, but certainly it is ‘contrarian.’ There’s not a lot of support in the economics community for Wiedemer & Co.’s viewpoint which considers the economy as evolving rather than cyclical, the standard understanding. They foresee a lot of civil unrest, many businesses and homeowners squatting and not paying mortgage/rent, huge changes in entitlements, significant decreases in inflation-adjusted salaries, and joblessness in the 40-60% range. Perhaps Jesus will return in the midst of all this forecasted chaos. Sycamores & Cedars – When God uproots, what should be our response? 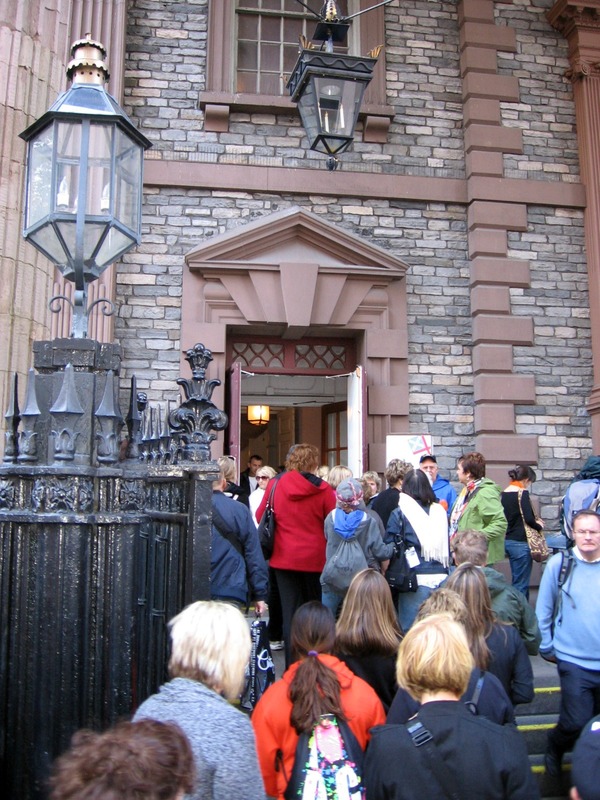 This is the entrance to St. Paul’s Chapel in lower Manhattan, completed in 1766. 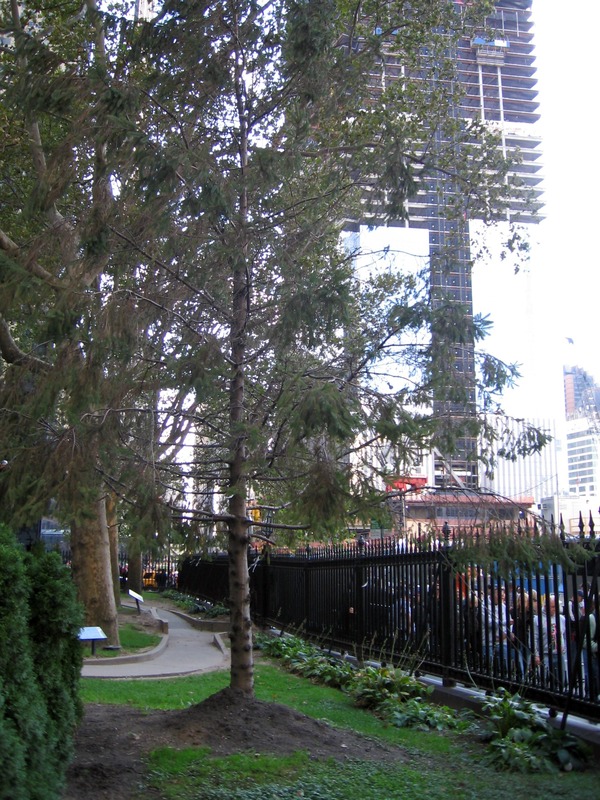 It is just across the street from the World Trade Center, which in those days was part of the church grounds. George Washington and several of his peers stopped to pray here after his inauguration on April 30, 1789. So “Ground Zero” is, in essence, the consecration grounds of modern America. Just over 212 years later on September 11, 2001, two planes were intentionally flown into Towers 1 & 2 of the World Trade Center. When Tower 2 finally collapsed it sent debris flying in every direction, including toward St. Paul’s. A steel beam was throw toward the church, but it struck a sycamore tree standing in the church cemetery, located between the WTC and the chapel. The tree collapsed and died, but prevented damage to the church. All around, buildings were wrecked and thousands of windows blown out, but not a single window was broken in St. Paul’s (one was cracked). No head stones in the cemetery were damaged, not even by the falling tree. For more details, read this. The dead sycamore tree was uprooted, and the stump and some of the roots were used by sculptor Steve Tobin as the basis for a bronze sculpture, now located at the front of Trinity Church a few blocks south on Broadway. It is called the “Trinity Root”, meant to symbolize unity and strength (see photo). In the place of the fallen sycamore, in 2003, a Norway Spruce was planted and was dubbed the “Tree of Hope”. 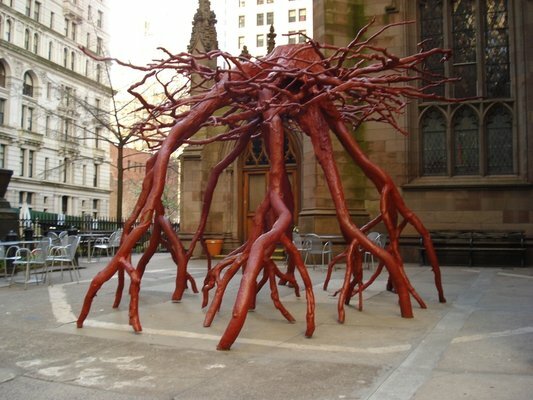 I was in New York City earlier this month and saw the Trinity Root and the Tree of Hope. A photo I took of the Spruce tree can been seen below. 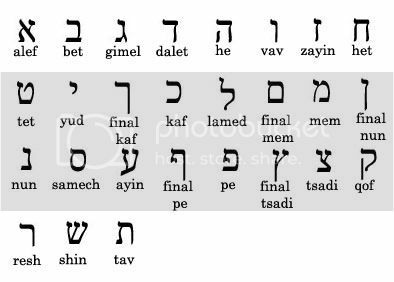 Amazingly there is a passage in the Bible that mentions both the sycamore and “cedar” (more accurately in Hebrew “coniferous tree”, ארז ‘erez, H730) in a single verse–Isaiah 9:10: “The bricks have fallen down, But we will rebuild with smooth stones; The sycamores have been cut down, But we will replace them with cedars.” Even more amazing is the fact that this very verse was quoted by representatives of the American government from the U.S. Capitol on several occasions shortly after 9/11–both Tom Daschle and John Edwards used this verse to describe America’s attitude following the attacks–we would rebuild and come out even stronger than we were before. May we take heed and may our hearts be softened to repent and turn back to God. It is instructive to learn from the examples of Mr. Daschle, former Senate Minority Leader and Mr. Edwards, who served as John Kerry’s VP on the 2004 Democratic Presidential ticket–Mr. Daschle was defeated in his last race for office and Mr. Edwards fell in disgrace due to marital unfaithfulness and also is out of office. The following videos go into more detail on the sycamore and cedar of ‘Ground Zero’ and offer amazing glimpses into God’s sovereignty in human affairs. Yesterday after work I went out to water my plants–most are on an automatic irrigation system, but a few trees and vegetables I still water by hand. Its relaxing, puts me in touch with nature, and helps me unwind at the end of the day. Being mid-July in Northern California, it is very hot and many of the plants need daily watering, particularly the potted vegetables. 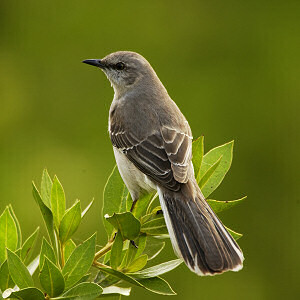 We’ve had mockingbirds raising a family for the last several weeks in our yard. At first we just heard the chicks in the nest, chirping for more food from mom & dad (mockingbird pairs tend their nest together). Later, the chicks started leaving the nest, and our cat became Enemy No. 1, with the birds often dive-bombing poor Boomer as he scurried for cover, keeping him away from their precious babies. But I went to retrieve some scissors anyway; I would try to free the bird if it wasn’t injured. I grabbed some gloves too, not wanting to get clawed or pecked! The netting was pretty easy to cut, being lightweight plastic, but for the bird it was more than adequate to keep him bound up. In fact the bird was tangled very completely, with netting around its neck, wings, legs, claws…it could not have freed itself, nor could its mommy or daddy have freed it, both of which were now over my head, making a racket. I first cut the bird free from the main net (yes, I now have a big hole in the net). Then I carefully gripped the bird in my gloved hand, and began carefully cutting away the netting. By now the chick (really a small bird, fully capable of flight) was chirping loudly and struggling to get away, and almost did once or twice. The more net I cut away, the freer the bird got, and the more he struggled to get away. Now if he had gotten away before I had the job completely done, he may have been hampered in flight, his growth could have been affected by the netting still binding him, or worse. I’m happy to report that I was able remove all the netting without losing hold of the bird, and without injuring him. I set him carefully up on the fence, and the moment I took my hand away he flew off to find mom and dad. I’m sure baby mockingbird had quite the story to tell. You are currently browsing the archives for the Slices of Life / Observations category.